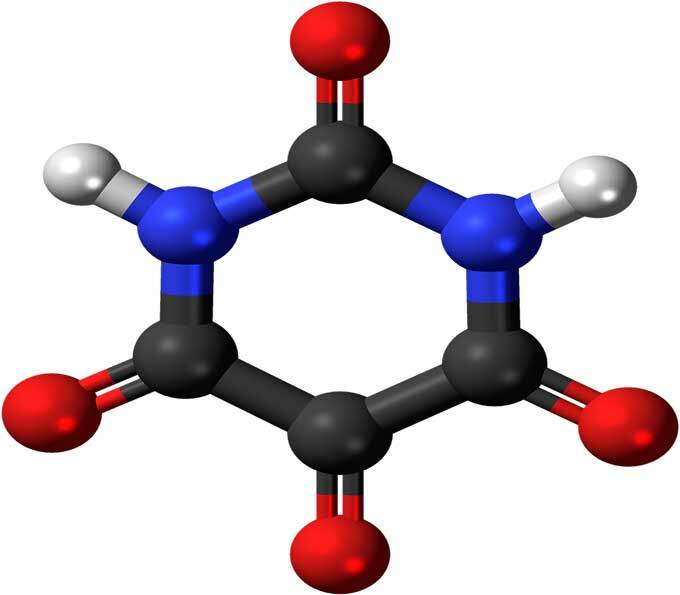 A chemical bond is an attractive force that binds atoms together to form new compounds. These bonds are formed in a process called chemical reaction. So, how these bonds are formed? To understand this concept, let’s first understand the structure of an atom. An atom consists of electrons, protons, and neutrons. Protons and neutrons are placed together in the nucleus; the center part of an atom. Whereas, electrons orbit around the nucleus at certain distances known as shells. 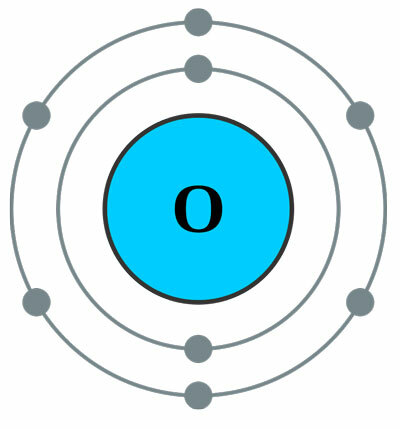 The number of electrons in a normal atom are equal to number protons, and the atom is said to be neutral. Each shell of an atom has a certain capacity for holding electrons. So, when lower shells become filled, electrons occupy upper shells to accommodate themselves. The outermost shell of an atom is called its valence shell. The first shell can accommodate 2 electrons, the second shell can 8 electrons, and the third shell can 18 electrons. (Read more at what is atom). Why is Chemical Bond Formed? Atoms always try to completely fill their valence shell with electrons to become stable. But, the number of electrons in an atom depends on the number of protons. So, mostly atoms can’t fill their valence shell completely. So, they need a way to complete their valence shell. For this reason, they form bond with other atoms. For example: oxygen has 8 protons, so it will carry 8 electrons. These electrons will accommodate in the shells as follow: two electrons will go to the first shell and the remaining six electrons will go to the second shell (here the second shell is valence shell). But as described previously, the second shell can carry 8 electrons, but here only 6 electrons are going to it. This will make the oxygen atom unstable, so oxygen atom will somehow try to get these remaining two electrons to complete its shell, or it will try to lose these 6 electrons to make the first shell as valence shell. Although, there more than two types of bonds. But, here only two types of the bonds will be discussed. In this type of bond, atoms will completely transfer their electrons between each other to complete their shells. Ionic bond will occur between the atoms of different elements and mostly occurs between metals and non-metals. lithium has 3 electrons in its shells. Lithium has to donate one electron or borrow seven electrons from another atom to complete its valence shell. But, donating one electron is easier than borrowing seven electrons so Lithium can act as a donor. Similarly, fluorine has seven electrons in its valence shell and it needs one extra electron to complete its valence shell. 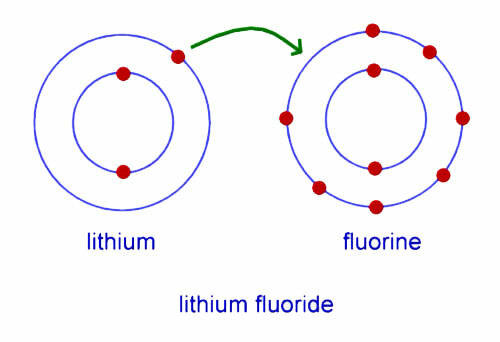 If lithium donates one electron to fluorine, they both can complete their valence shell. By doing so, both atoms will become electrically charged. Now, Lithium will have more protons than electrons so it will become positively charged lithium ion, and fluorine with increased number of electrons will become negatively charged fluorine ion. This charge difference between them will create an electrostatic force of attraction between them. As a result, both atoms will be attracted to each other and will be held together. This way a new substance will be made called Lithium Fluoride (LiF). In this type of bonding, electrons are shared between atoms to complete their valence shells rather than transferring their electrons. Electrons are shared in pairs; each atom has to share same number electrons to make pairs. Shared electrons become part of each covalently bonded atom. They constantly circulate between them. This type of bond mostly occurs between non-metals. The oxygen atom has 6 electrons in its valence shell, and hydrogen atom has one electron in its valence shell (which is also its first shell). Oxygen needs two electrons to complete its shell and hydrogen needs one electron. So, oxygen takes two hydrogen atoms and shares its one electron with each hydrogen atoms. Hydrogen atoms also share their one electron with oxygen. So, two pairs of electrons (4 electrons) are shared in this bond. Oxygen has four shared electrons, and four remaining electrons in the valence shell, which make its valence shell complete. Both hydrogen atoms have one shared pair of electrons (2 electrons), which make their valence shell (in this case, first shell) complete. In this bond oxygen and hydrogen atoms that are held together due to sharing of electrons. This new substance which formed as a result of their bonding is called water (H2O). Valence shells of noble gases are complete. So, they don’t form any bond in normal condition. Common table salt (NaCl) is formed when Sodium donates its one electron to chlorine gas. Abdul Wahab, "Chemical Bonding," in Science4Fun, April 13, 2019, http://science4fun.info/chemical-bonding/.